The Engage Cable is a continuous length of 2.5mm2 cable with pre-installed connectors for Enphase Microinverters. The cable is handled like standard outdoor-rated electrical wire, allowing it to be cut, spliced and extended as needed. 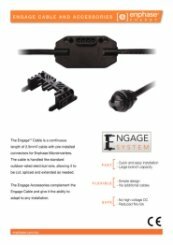 The Engage Accessories complement the Engage Cable and give it the ability to adapt to any installation.